One of my favorite companies right now is NECA. Sure, back in the day (a saying a absolutely hate, but use anyway) they had some pretty weak offerings. But over the last couple years things have been changing, and it's for the better. With the release of the Hellraiser line, Gremlins and Christmas Story, I now have another company I've come to expect great things from on every release. Last summer at the SDCC, they announced the Marvel Collectors Club. This club was developed by NECA and Marvel together, and will be releasing exclusive Marvel collectibles not available anywhere else. 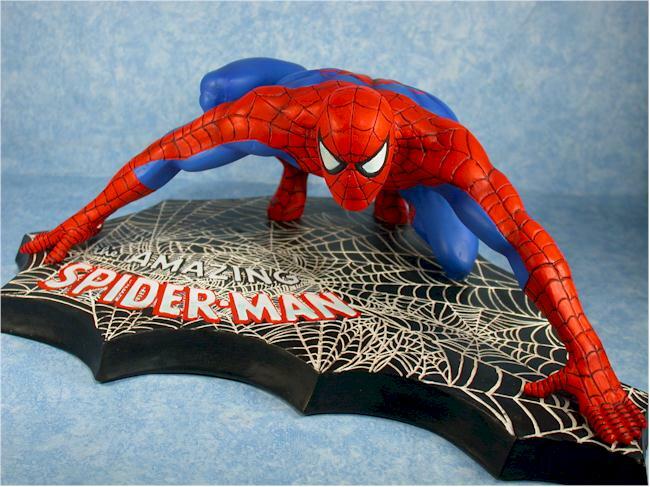 For $35 you can sign up as a member and also receive the first collectible, this very cool Spider-Man resin sculpture. They should be releasing additional items every couple months, and the Psylocke statue is next on the list. They may do mini-busts at some point, and they are considering a pair of those at the $35 price point. It's also possible to become a 'super member'. There are only 500 super members, and these folks will automatically get each collectible shipped to them as soon as it's available. Instructions for becoming a super member are in the FAQ at the site. Nope, the packaging ain't nothing to look at. It's just a plain box, but inside the sculpture is packed in form fitting Styrofoam, just like you'd expect. The plain boxes allow for cheaper prices, and easier shipping direct from the manufacturer. Since the value on these is so high, I'm all for going with the plain boxes. Besides, who cares about the box for a statue? Toss this one and you won't feel bad. The sculpt is done in a rough style, with deep cuts for the webbing on the uniform and clear folds in some areas of the costume like the hips. The overall detail and appearance are excellent, although this rougher style might not be everyone's cup of tea. The site says these are sixth scale, although it seems a little small to me for that. It is bigger than the Famous Covers Spider-Man though, so it is fairly close. The base is about 10" across. The base is also very detailed, with a scalloped cut around the edge, the Amazing Spider-Man logo, and plenty of webbing. The paint aps aren't quite as nice as the sculpt, but they are acceptable. The colors are nice and bright, as you'd expect with the red and blue outfit. The webbing is fairly clean and neat, but the large colors, especially the red, aren't quite as consistent as I'd like. There's a little variation across the expanse, enough to be noticeable if you're paying close attention. The paint ops aren't too far out of line with other sculptures though, where clean lines are often sacrificed for artistic interpretation. One of the best features is the soft wash on the blue of the uniform, giving the impression of shadow without being excessive. 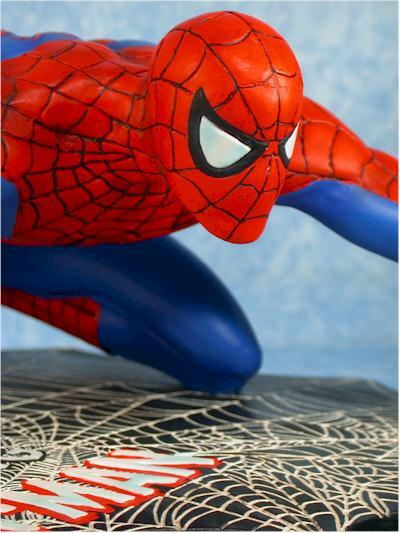 Spidy is in a great crouched pose, fingers extended, muscles tense, ready to spring. The overall quality of the resin is top notch, similar to similar statues costing at least four times as much..
Talk about a solid deal! Let's look at the collectors clubs that are out there. Palisades has a terrific club that provides early info, and the opportunity to buy the show exclusives. For $50 you get a lifetime membership, and one free show exclusive figure. Then you get the option to buy more show exclusives as they become available. Art Asylum recently started a collectors club, and it's similar. For $30 (annual) you get one free show exclusive, plus the privilege to buy additional ones as they become available. Mcfarlane has one of the oldest collectors clubs floating around out there. It's morphed through the years though, and now it's basically an email list that allows you to shop at the on-line store. Signing up is free, and you buy the on-line exclusives as they become available. All these clubs do about the same thing - charge you a fee for a figure and the right to buy more. Mcfaralane's club might seem different, but since the only reason to sign up is to buy something, they assume they are getting the cost of the figures along with your sign up. The MCC seems similar...EXCEPT instead of getting action figures, you're getting polyresin STATUES. These things cost anywhere from $40 for small ones to $100 or more for large ones, and here you're getting them for $35. 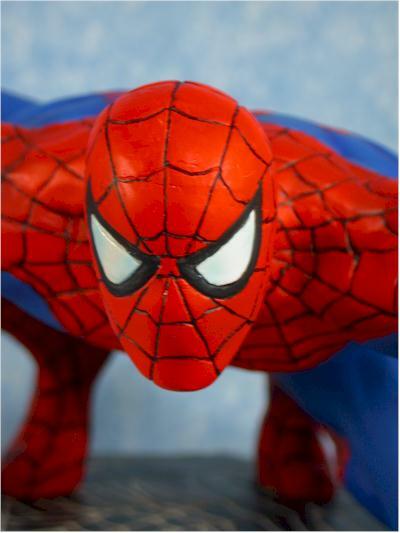 The Spidey is well worth the money, even if you never buy another statue or bust. Psylocke is a full 12" statue, and they are sticking with this very low price of $35 for her. That's a fantastic deal if you're a collector of statues and busts. You don't see this level of quality in licensed products for anything near this price point. I'm extremely impressed with the level of detail, quality and size at this price point. This is one of the best values I've seen in awhile, and considering that it comes in a high end market rather than the low cost world of action figures, it's all the more impressive. I wasn't sure what to expect when I first signed up for the club back in July, but I'm sure glad I did now. If Psylocke is anywhere near this level of quality, she'll be an absolute steal. Now if DC would just do something like this, I'd be in heaven. The club is the place to pick these up. 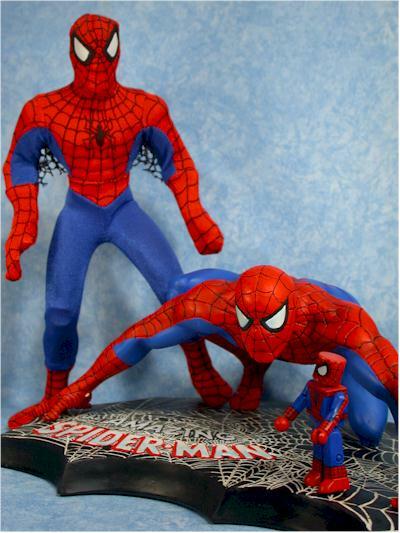 Spidey is limited to a run of 2500, and for $35 you get him plus a one year membership with the right to buy the other statues released during that year for the low price of $35 each.